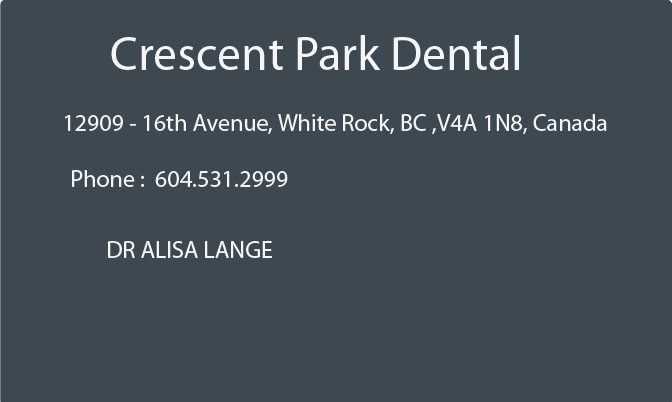 Dr. Alisa Lange’s practice has been valued in our family friendly community for over 15 years. Together with her associates, she is committed to providing optimum care to her patients and growth through the expansion of new services to meet all oral health care needs. Dr. Lange is dedicated to education and ongoing training thereby demonstrating her passion for dentistry. An accredited dental team providing professional individualized care . A modern clinic with a comfortable and relaxing environment. A full range of treatment services allowing our patients to choose the right option for them. Bonding is used to restore teeth that are chipped, cracked, discolored, or misarranged. In some cases, it’s used as an alternative to veneers. The tooth is prepared for the procedure by lightly etching the surface and applying a bonding liquid. Once the liquid sets, a plastic resin is applied and sculpted into the desired shape by the dentist. A curing light is used to set the material and then it is trimmed, smoothed, and polished to a natural appearance. The procedure can usually be done in one visit. The bonding procedure can significantly improve the appearance of your teeth and often be completed in a single office visit. However, the composite material used is not as strong as your natural tooth enamel, and is more likely to stain, chip or break than natural teeth. A tooth that has been compromised by repeated fillings or root canal therapy may need to be crowned. The tooth is prepared by reducing it in all dimensions. An impression is taken and sent to a dental laboratory for a metal or porcelain crown to be fabricated. On your second visit the crown is cemented onto your own tooth with a tight seal. Teeth with crowns should last many years with proper periodontal care. While it is possible to have a crown fabricated in one visit with a specialized machine we feel a custom made crown fabricated by a skilled dental technician is a better choice for our patients. Perhaps you want to improve your smile; to look healthier and younger, or add to your self-confidence. Maybe an accident has caused a loss of teeth. Could be you are dealing with loose, uncomfortable dentures, or failed bridgework. Or perhaps years of dental problems, worn teeth or failed restorations have made speaking and eating more difficult. Dental implants are like a second chance at having natural teeth. Dental implants are embedded in your jaw like the roots of natural teeth, a permanent addition to your mouth. Once your implant is placed and healed they will provide an anchor allowing you to close the gaps from missing teeth with a crown or anchor custom-fit dentures and partials for unsurpassed stability and comfort. These are as easy to care for as natural teeth, and thoroughly comfortable for eating and talking. The beauty of dental implants are they act like natural teeth; but they do not decay, get gum disease and are never sensitive requiring a root canal. Today, there are patents who have been successfully wearing implant supported teeth for as long as 30 years. Whatever your need for cosmetic or functional improvement, Dr. Lange and associates can restore the look and feel of your original, natural teeth. Their approach balances the importance of function and comfort with aesthetic appeal. Whenever possible the doctors recommend early treatment to avoid more invasive procedures down the road. Dr. Lange and associates pride themselves in practicing with a conservative approach, always considering what’s best for their patients’ long-term oral and general health. When more than half of the tooth’s biting surface is damaged, we may use an inlay or onlay. These are made of porcelain, gold or composite resin. The inlay or onlay pieces are bonded to the damaged area of the tooth. An inlay, which is similar to a filling, is used inside the cusp tips of the tooth. An onlay is a more substantial reconstruction, similar to the inlay but extending out over one or more of the cusps of the tooth. Both restorations require two appointments to complete the procedure. While the inlay/onlay is being fabricated at the dental lab, the dentist will apply a temporary sealant to protect your tooth. Traditional fillings can reduce the strength of a natural tooth by up to 50%. Inlays and onlays are bonded directly to the tooth using a special high strength resin which can actually increase the strength of a tooth by up to 75%. In some cases, where the damage to the tooth is not extensive enough to merit an entire crown, onlays can provide a very good alternative. Teeth that are chipped, cracked, worn, spaced unevenly, crowded, or severely stained can often be transformed with porcelain veneers. Veneers are thin shells of porcelain that bond directly to the front of the surface of your anterior (front) teeth. Placing custom veneers requires a high degree of technical skill and attention to cosmetic detail. The result is a natural, beautiful smile. When bonded to the teeth, the ultra thin porcelain veneers are virtually undetectable and highly resistant to coffee, tea, or wine stains. For strength and appearance, their resemblance to healthy, white tooth enamel is unsurpassed by other restorative options. With proper care, porcelain veneers will brighten your smile for over a decade. Refraining from using your veneers as tools to cut and open things will prolong their life, and if accidental breakage or damage occurs, it is usually possible to repair only the veneer involved. Natural teeth are meant to last a lifetime. Even if one of your teeth becomes injured or diseased, it can often be saved through a dental procedure known as Endodontic therapy. Years ago, when the interior pulp of a tooth became damaged or diseased, the only solution was to extract the tooth. Now, it is often possible to save such teeth through Endodontic treatment, more commonly known as root canal therapy. With proper care, teeth that have been saved through root canal therapy can last as long as your remaining natural teeth, as long as the tooth is properly restored afterwards by your dentist. Invisalign can give you the beautiful straight teeth you’ve always wanted and no one can tell you’re wearing them. They are removable and virtually invisible. The Invisalign System is a series of clear orthodontic appliances, called aligners that allow you to straighten your teeth without having to wear traditional braces. Each pair of aligners in the series is worn in two week increments. This moves the teeth in small steps to the desired final position. The Invisalign System is an alternative to braces for patients who have full adult dentition and complete jaw growth, and it is effective on a broad range of cases. Our doctors can determine if you are a good candidate during an exam. Old unsightly silver fillings can now be replaced with esthetic filling materials such as resins and porcelains. This type of restoration matches your natural tooth color and is esthetically pleasing. Less than half of patients diagnosed survive three years therefore early detection is important! Following our commitment to offer preventative care, we offer an annual Velscope Cancer screening test. This screening can be performed by the hygienist at one of your hygiene appointments or booked separately. The cost is $35 and is covered by some plans. Trust Crescent Park Dental to provide the best oral care possible. Be proactive and have yourself screened on your next visit. Anyone can appreciate that a smile can bridge a gap between any two individuals; it has been said that a pretty smile can even disarm the strongest of opponents in any argument! At Crescent Park Dental we offer two options to our patients; traditional orthodontics with metal bands and wires, and Invisalign™ a new, innovative, clear retainer system. The ease of wearing clear retainers and the lack of bands and brackets makes it a popular choice for many patients. Both work well in the appropriate situation. Orthodontic treatment or tooth straightening is a detailed science used to align teeth for functional and aesthetic purposes. In many cases, orthodontic treatment is often associated with children and teens but what if you didn’t get the orthodontic treatments you required when you were younger? The great news is that you are not too old to improve your oral health with the benefits of Orthodontics. Orthodontic treatment can be used successfully on children, teens and adults providing functional benefits with bite, improved hygiene, comfort and aesthetics. We also find that our patients experience an enhanced self-confidence because of their straightened teeth and more beautiful smile. If you are considering orthodontics for yourself or one of your children, Dr. Alisa Lange has been creating beautiful smiles with orthodontic treatment for many years. While she is not a certified orthodontist, she has taken a specialty program and ongoing training which enables her to provide orthodontic treatment on appropriate cases. Her work is supervised by a resident orthodontist at the University of British Columbia. Dr. Lange’s fees and evening hours make her Orthodontic skills attractive to many patients. Financial arrangements are finalized; payment schedules are available for orthodontic treatment. A proper home care routine and compliance with the instructions provided by your Crescent Park Dental team are critical for the successful completion of any orthodontic procedure. If you have any questions please contact our office and ask to speak to Debbie, she is our Orthodontic Department Coordinator. You will see her smiling face from the first consultation, through every check-up until you have successfully completed the retainer phase of treatment. Her caring manner and years of experience will ensure a positive result!